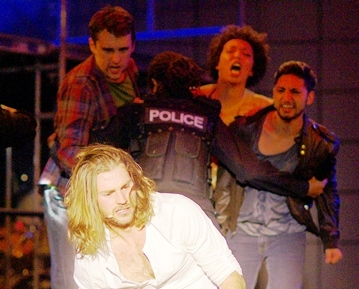 Normally I have some sort of well-thought-out anecdote or analogy to say before I get down to the nitty-gritty of my review, but this time I’m just going to get right to it and say that Jesus Christ Superstar at U of T’s Hart House Theatre is absolutely fantastic and one of the best adaptations of Andrew Lloyd Weber’s rock opera I have ever seen. This musical can admittedly be difficult to pull off due to the vocal range needed for some (or all) of the main characters and the general complexity of the score. However, Aaron Williams (Judas) and David Michael Moote (Jesus) were able to belt it out like the best of them, and absolutely blew me away with their performances this evening. Saphire Demitro absolutely stole the show with her incredible rendition of Herod’s Song that used the most appropriate pop-culture references ever. The entire concept of the show, as explained by the director was to compare the reactions of people now with how people would have reacted 2000 years ago. He used the news stories of riots, war and the Occupy Wall Street movement as an incredible backdrop for the iconic rock opera to take place in, and let me tell you, it was powerful and screamed relevance to today’s culture. I highly recommend seeing this show not just for its astounding cast and stellar themes (or the fact that the house was absolutely packed), but for the simple fact that regardless of whether you go alone or with a huge group of people, you will have the time of your life seeing this (there are not enough superlatives in the English language to describe it … so use your imagination) performance. Another successful combo from D.L.T.